Volumetric mixers are a batch plant and mixer in one unit. Volumetric mixers batch, measure, mix and dispense all from one unit so every time you have the precise design mix and quantity needed. Control your concrete and produce fresh, high strength concrete anytime and anywhere you need it. A variety of mobile and stationary models that provide virtually unlimited applications gives you the flexibility and versatility to do almost any concrete job. Check out our Most Popular Questions answered about volumetric mixers. Visit VMMB (Volumetric Mixer Manufacturers Bureau) for white papers on how volumetric mixing works. 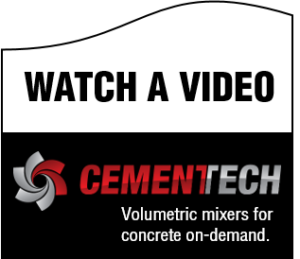 Or check out more videos to see volumetric mixers in action!